I ordered the castle cake kit from Wilton online, I’ve never made a castle cake before so I went the easy route! lol, although it didn’t end up being very easy! The towers kept tipping over. I used royal icing to hold them down but they would still lean, and my two year old kept taking the tops off and eating the frosting off! It took me 2 days to make this cake! I baked 2 round cakes, 8 inch and a 6 inch. Covered them with fondant then using the kit from Wilton I started stacking them on and around. Use royal frosting, it hardens and helps hold it. I used the royal frosting for the decorations. Also the party was in the middle of summer and outside so I didn’t want the cake to melt! My hand cramped so bad by the time I was done and hurt for a couple days afterwards. 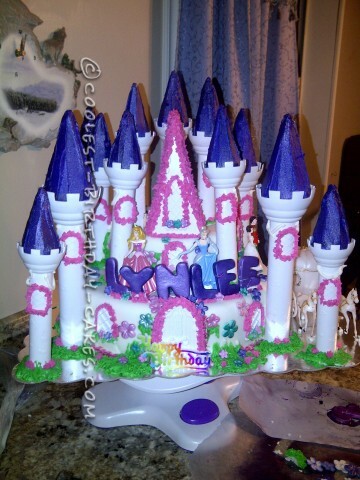 You wouldn’t think a castle cake would be too hard, which it wasn’t but it still was a lot of work and took a lot of time! Well took a lot of time because of my two year old! lol.